Brief – The holiday cottage sector is a crowded space, not least in beautiful East Sussex. 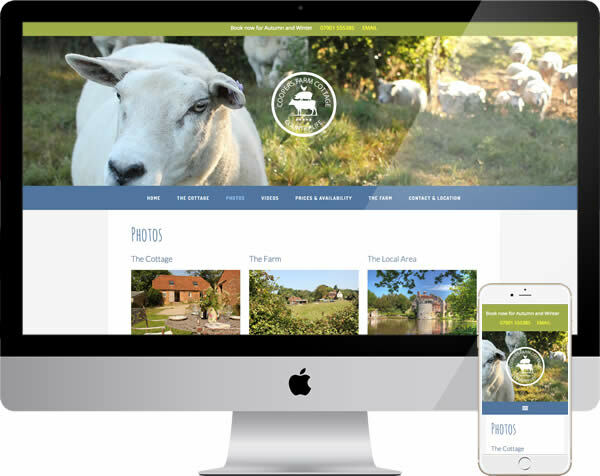 Website visitors could come from search, or specialist directories, Coopers Farm needed to give them reasons to stay. They had distinct advantages. A picturesque, 5 star cottage on a working farm, a wonderful location and welcoming, committed owners. Our task was to reflect this in a clear way, encourage web users to go on a journey to the right conclusion, a confirmed booking. Technical & Search – The existing website raised a few search related needs, correcting mixed indexing (www & non www) plus odd malformed urls, straightforward to tie these into the new site. An online availability calendar would help encourage booking decisions. An up to date module soon added, desktop and mobile friendly. Our main technical task with this website was to aid the required content and design input. Ensure that a largely visual message would be delivered with speed, no slow pages. Design & Build – A web designer must sit in a user’s seat. In this case, a seat where that user is likely to be flicking from cottage to cottage. The design needed to make them stop, call others over to take a look. With quality and choice needed, our designer in this case decided to be their own photographer. Ensuring the right visual focus. The site was designed alongside content, simpler messages leading to more detail, information delivered at the right stage of the user journey. Outcome – Although the sector is busy, we would like to think this website stands out and their visitors tend to confirm that view. The improvement in user stats significant. A farm cottage people truly enjoy has an online life which reflects this. People can see the opportunity and the owners are equally satisfied. You can view more examples of our work, or read more about the options we offer in our introduction to web design. By all means get in touch if you would like to discuss your own web project.